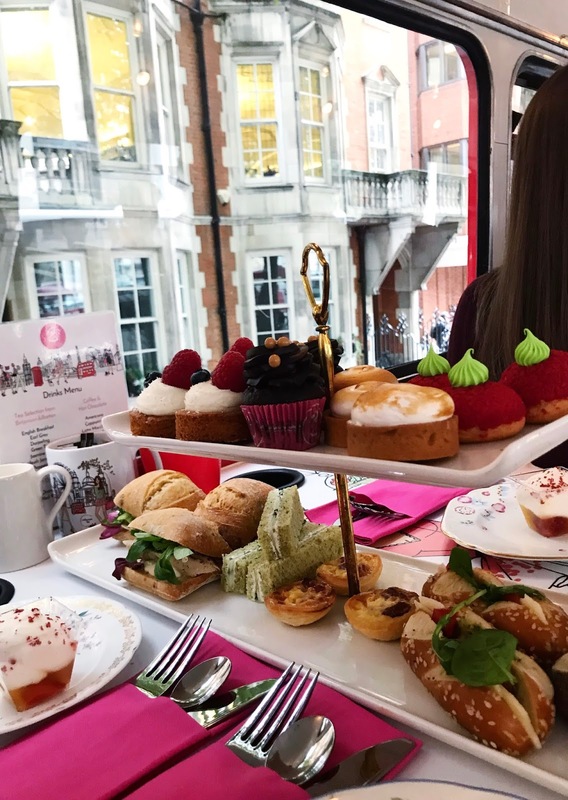 Recently I've become somewhat of an afternoon tea conoisseur, definitely not intentionally though, I think I just have a little bit of an obsession with miniature sandwhichs and ornately decorated cakes and pastries. So it was no surprise that when my birthday rocked around early this month, my family decided that an afternoon tea out would be the perfect gift. On a quest for something unique though, my mum decided against the many posh hotels within the area, and opted for an afternoon tea with a twist. 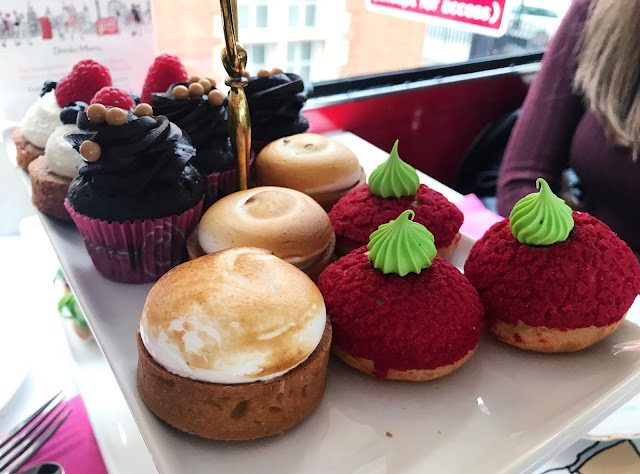 An when I say twist, I mean totally unexpected, as our afternoon tea experience took place on the top deck of a London double decker bus! If like me, you haven't heard of this even being a thing before, then I'd urge you to take a peek at B Bakery's Afternoon Tea Bus Tour. 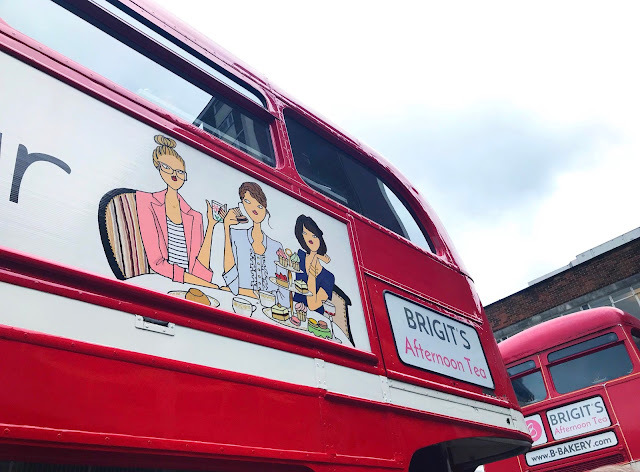 A quirky and novel idea, each of the buses has been converted to add tables to provide an unconventional dining experience - they've even thought of cup holders on the tables, so that your precious cup of tea won't go flying across the bus! We were lucky enough to be sat on the top deck for the 1 1/2 hour long tour, and let me tell you the two tiered stand presented to us upon arrival was feast for the eyes. 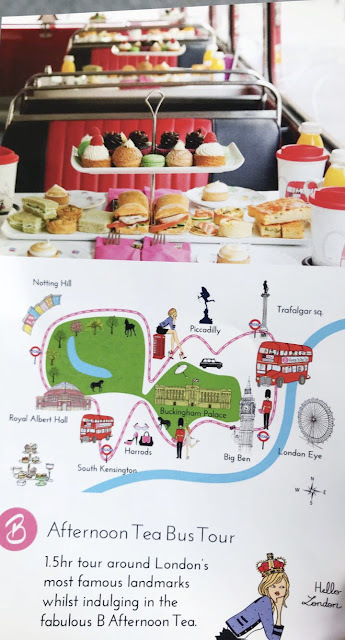 The exquisite selection of sandwhiches, mini quiches, cupcakes and other baked treats were truly marvellous, particularly when teamed with London's bustling views - we felt like royalty with people waving to us as we stuffed our faces with the colourful goodies. Just when I thought I simply couldn't eat anything more, the wonderful waiters brought out warm scones, cream and jam, which left me feeling like it'd be rude not to indulge..
What's more, at the end of our tour the team who did a fabulous job of keeping our tea topped up, let us take our gorgeous travel mugs home - the perfect souvenir! B Bakery run a variety of bus tours, from gin tasting, and Halloween-inspired afternoon teas, through to Christmas afternoon teas nearer December. A fun and delicious way to see of the areas of London you might not have experienced before, I'm already thinking about booking up the Christmas tour for later in the year - better hit the gym first though! As a long time fan of Vaseline, in particular their lip therapy tins, I'm always over the moon to add another limited edition tin to my cosmetic collection - I don't ever intentionally collect anything, but I have to admit to owning every single limited edition design that Vaseline have ever created! 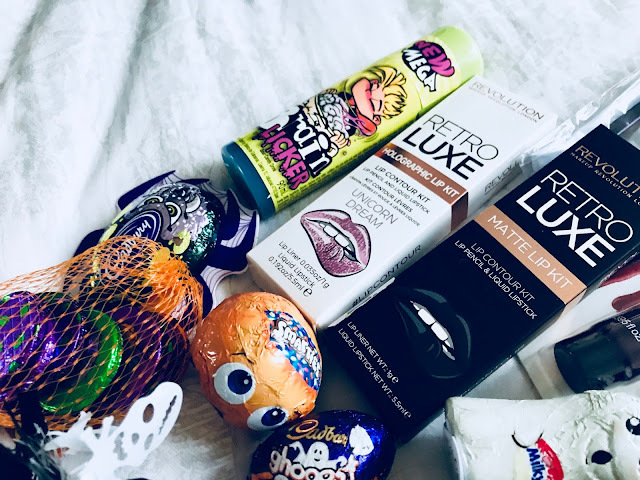 For a second year in a row now, Vaseline and Lulu Guinness have teamed up to create three new limited edition products, to join last year's Lulu lip balm. And I'm excited to say that once again I have been sent the brand's gorgeous new cosmetics to review. 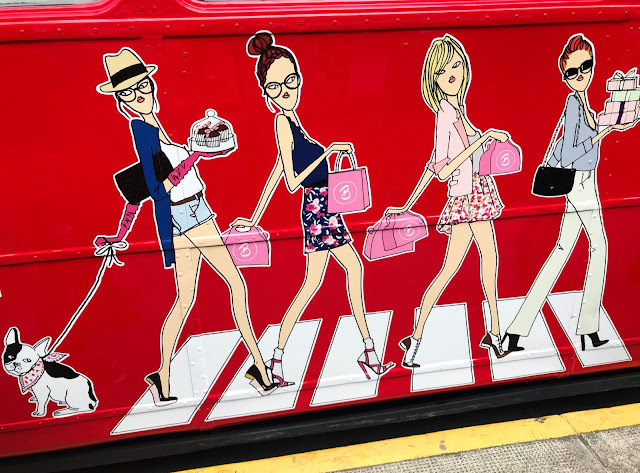 With Lulu Guinness being such an iconic designer - I simply adore her array of clutch bag designs, it makes absolute sense to me that the two brands would collaborate to create the ultimate handbag essentials. This year, the collaboration has seen two new lip balms and a hand cream hit the shelves. Our favourite 'handbag BFF' is back now with a few new friends including Violet Doll Face Original Lip Therapy Tin, Poppy Doll Face Tinted Lip Therapy Tin and Lily Doll Face Hand Cream - each with their distinctive looks and personalities. "Whether you're free spirited, ooze Hollywood glamour or thrive in the city, there's a new limited edition Lulu x Vaseline product to suit your personality. The question is.. Which Lulu girl are you?" I took Lulu Guinness' quiz, and my Lulu girl personality came out as Lily, which I think is actually a pretty accurate match if I'm honest! "You ooze Hollywood glamour. Your style encompasses all things vintage and features nostalgic playful pieces. You love to relax with a good book (alongside a cheeky cocktail!) in the week, but come the weekend the party doesn't start until you arrive." I have to say I really enjoyed seeing a mini selection of products in this year's collaboration. I definitely feel that whilst last year's lip therapy tin was such a glamorous design, it would've been nice to have seen a tinted version too. Which is exactly what the Poppy Doll Face tin caters to this year, with its gorgeous rose-tinted balm leaving you with that 'just bitten' look. The original Violet Doll Face tin will be perfect for applying before bed, whilst the Poppy tin will definitely be my chosen handbag BFF. Not forgetting of course, the Lily Doll Face hand cream, which will 100% be coming to work with me, to live on my desk. Light, non greasy and delightfully scented, the Lily hand cream is definitely my 'must-have' recommendation from this collection. The cream claims to "prevent nails from chipping or breaking: in 2 weeks nails are 10x stronger" which makes it a miracle product for me if the claims turn out to be true. I'm addicted to gel manicures which are oh-so beautiful, but definitely weaken my nails, so a little TLC in the form of this hand cream is exactly what I need right now. I'm a sucker for packaging, and these striking designs are literally a 'blogger's dream come true' - I mean who doesn't love delicate pastel shades and bold girly graphics? But that aside, I truly believe in the quality of the products inside. There's a reason I've always been behind Vaseline as a brand, and I'm really excited to see hopefully more collaborations with Lulu Guinness in the future, and other limited edition flavours too! All of the products in this post should be exclusively available to purchase in your local Boots, or at Lulu Guinness this month - if you haven't already spotted them of course! The recommended retail price of the lip therapy tins is £2.99 and the hand cream is £3.65, so don't miss out on the opportunity to pick up your very own Vaseline X Lulu Guinness handbag BFF! Now if you'll excuse me, I'm off to lust over Lulu Guinness' iconic lips clutches once again! Pumpkin season is in full swing. I've personally already carved up two for my doorstep, and have two more to decide on whether to carve, or decorate with paint and glitter. But one of my other big pumpkin passions, is baking with them. Though it's more of an American Thanksgiving tradition, the last few years I've had a go at making pumpkin pie. Now one of my autumn highlights, this year I wanted to try experimenting with more pumpkin and autumn inspired recipes, and create an array of cinnamon spiced treats to tuck in to. I ended up spending my Sunday morning in the kitchen, whipping up a batch of Skeleton Shortbread Biscuits and the Pumpkin Passion Cupcakes you'll find referenced below - mine look a little different since I decided to leave out the pecan nut topping, and instead opted for edible glitter. Are they Instagram worthy? Probably not. But I love the satisfaction I got from making something from scratch, and how relaxed it made me feel. So having caught the baking bug, I let my belly do the browsing, and shortlisted five recipes (including the cupcakes I made photographed in this post) which I think sound utterly delectable, to add to my personal baking list. Who doesn't love cupcakes? These spicy, cream cheese frosted cakes are about as autumnal as you can get. Plus they'd be perfect for impressing your colleagues at work. Nothing sends me back to firework nights as a kid, quite like a sparkler or a toffee apple. Though my tastesbuds havent changed, these days the idea of biting into a rock hard, toffee-covered apple sends my mind into a frenzy, fearing emergency dental work. So what better way than to encapsulate the taste sensation of a toffee apple, than by putting it into a cake? Plus if you're feeling brave, the option to create a showstopper, worthy of Great British Bake Off, is there by adding spun sugar. Though I saw the contestants have a go at that, and I don't think I'd have the same flair for it..
Sweet and spicy with ambitious tiering, this cake will look super cute on any cakestand this Autumn. I'm already picturing a slice of this with a cup of coffee on a Sunday afternoon, whilst I lounge about watching Netflix - perfection! I must admit I haven't ever had s'mores, but have always loved the idea! These beauties combine succelent pumpkin, with melting marshmallows for an American taste sensation that'll help you keep warm by any fireside this Autumn. And finally, what baking list would be complete without the addition of pumpkin pie? A must-have, October treat for me every year that all my friends and family enjoy too. When I get round to making these I'll hopefully share them on Twitter if they haven't been a total disaster! I know sometimes it's hard to source cooking pumpkins for recipes, but thankfully all of these suggest switching pumpkin for butternut squash - I won't tell if you dont! NEW Glossier Cosmetics in the UK - Is Glossier Makeup Worth The Hype? I'd say I'm pretty guilty of jumping on the bandwagon when it comes to new cosmetic products. 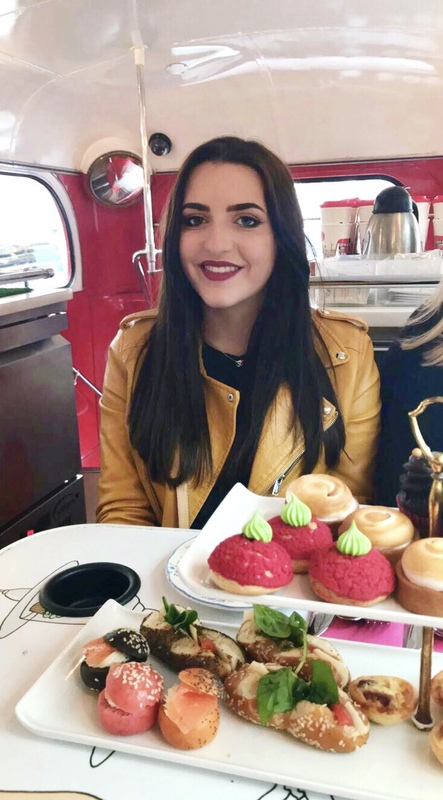 Whether it was queuing online to get my hands on Kylie Jenner's very first few lip kits, or rushing to buy Too Faced's Sweet Peach palette, I'm basically a marketer's dream. Which is pretty ironic really, considering that's my job. 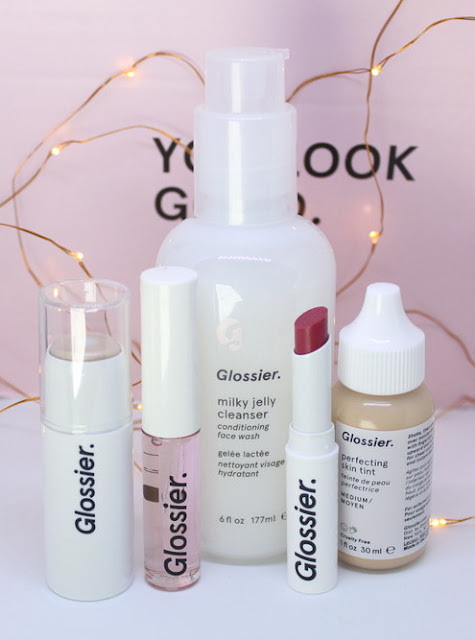 So it was no surprise, that this month when Glossier finally arrived in the UK, I was straight on their website adding their products to my shopping basket - as if the gorgeous packaging and social media photos weren't enticing enough, the endless discount codes on Twitter definitely caught my eye. 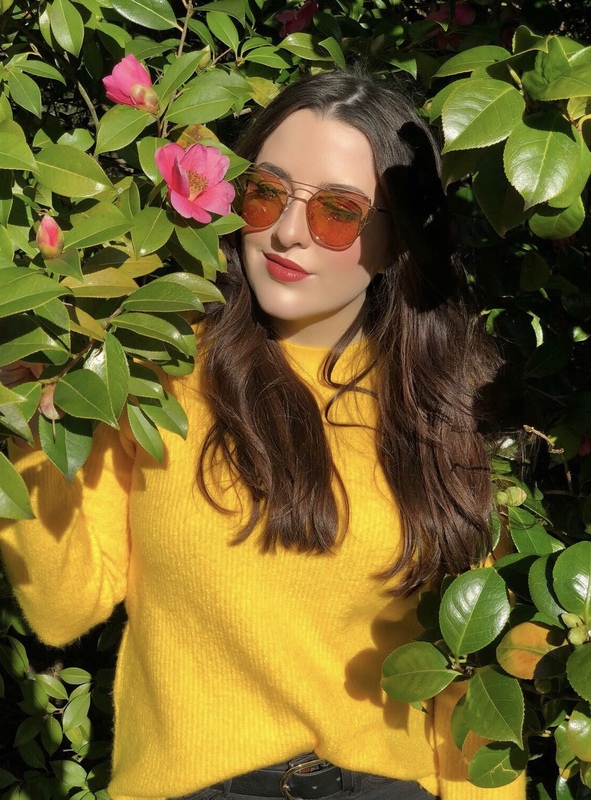 Glossier are all about low maintenance, natural beauty and glowing, dewy skin, both of which I'm totally on board with, particularly in the winter months when you're lacking vitamin D and desperately hankering after your sun kissed summer skin. As someone who's makeup of the day is definitely dictated to by time, I'm always on the look out for products that'll easily integrate into my existing routine, but also shake up my look a little. I have to admit I was pretty sad not to be able to pick up Glossier's Cloud Paint blush (it was out of stock at the time of purchase), after looking at tutorials and swatches online I was pretty taken with the pigmented glow it achieves, but there's always next time! I've actually waited a week to write this post so that I can give an honest opinion of the products, having given them a fighting chance to wow me. So here's my opinion on each of them! As a lover of Estée Lauder's Double Wear foundation, I'm addicted to full coverage, but I'm always open to trying out lighter formulas that will suit low key, lazy days. I'd say this particular product is somewhere between the coverage of tinted moisturiser, and a BB cream. In shade Medium, I can achieve a glowy, sheer veil that gives my skin a healthy, no makeup look - definitely not a product for days when I'm breaking out though, as there's no way the silky, translucent texture of this product can be built up to cover blemishes. That said, teamed with my favourite Clarins concealer for my dark under eye circles and rogue spots, I'm quite a fan of the natural look I can create. The staying power isn't amazing, but with a little loose powder, this skin tint gives me enough confidence to pop to the shops without feeling self conscious. If I was actually motivated enough to get in the gym again, I'd say that this would be my go to product. I was a little weary of this highlighter, having only used powder products before, but was pleasantly surprised with how effective this little bad boy was. A sweep of this across the skin achieves a beautiful, dewy look that screams healthy and well-rested. Initially it feels a little tacky, but soon settles into the skin, and doesn't make my foundation separate and disappear, as other creamy products can do. Overall I really can't fault this highlighter, and would go as far to say as it could become an everyday addition to my makeup routine. I love, love, love, matte lipsticks. Flattering and fabulous, they just complete my makeup looks time and time again, but sometimes their formulas can be a little drying and heavy for everyday wear. This is wear Generation G comes in. A sheer matte finish, that glides on with ease and precision, it has a sort of 'just blotted' look to it that I'd say is very french-chic. Am I crazy about the shade 'Crush' I chose? Not really. I find it to be just a little too pink for my liking, but I really do love the wearability of this little gem. A magnet to matte lipsticks, it's not often you'll find me sporting a shimmy shimmy lip gloss. But I do love experimenting with new looks, and saw the positive reviews on this particular gloss and thought I'd take my chances. Crystal clear and non-sticky, with the most gorgeous diamond shine to it, I think I'm a lip gloss convert. I usually dislike the sparkly glitter, stickiness of standard glosses, but there's none of that with this. With a little lip tint underneath, this gloss creates a stunning shine that perfectly sets off your dewy skin. I picked this cleanser up because it was so hyped online, and I have to say it has lived up to my very high expectations. One pump of this product has the power to dissolve my mascara-layered eyelashes, lipstick and heavy-duty foundation. I'm so over battling with makeup wipes that only leave my skin dry and sore, this will definitely be my holy grail cleanser going forwards. So overall I'd definitely say that Glossier's arrival in the UK has been a smashing success for my ongoing makeup addiction. And has once again taught me that all the beauty bloggers and vloggers I follow online, know their stuff! I'd definitely recommend Glossier to my friends and family, and anyone who's looking to go natural with their daily make up looks. If you've read my post and now feel compelled to try some of Glossier's products out for yourself, click here to get 10% off your order at the checkout - happy shopping! Like most of you, Halloween is one of my favourite holidays - second only to Christmas obviously. From the ghoulish decorations, to the gorgeous guises, there's something so fun and mysterious about it, that gets me excited every October. Its usually my tradition to carve up a couple of pumpkins whilst watching Practical Magic (which if you haven't seen by the way, you're missing out!) with my sister. But this year, I wanted to make it extra special and treat her to a little Halloween-themed gift, because I don't get to see her that often anymore. 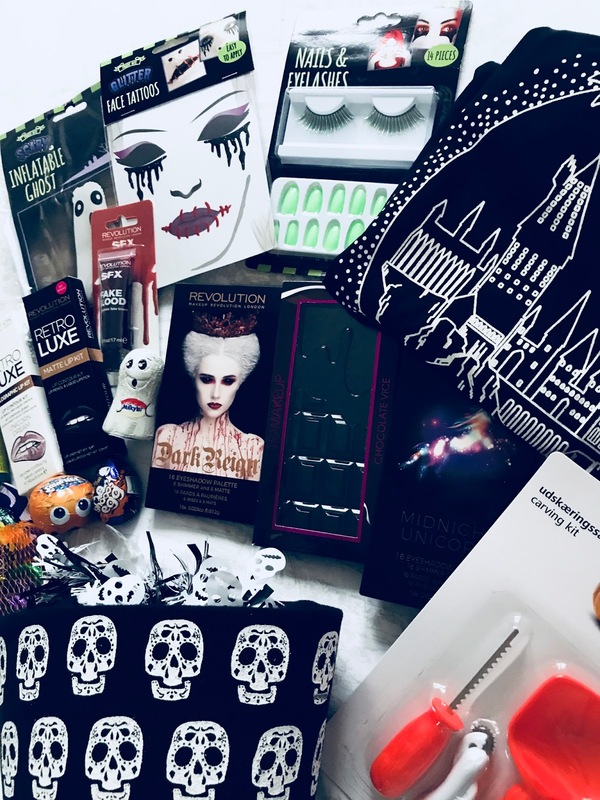 So with this idea in mind I decided to head into town and find all sorts of spooky goodies to put together for her, and though it's Halloween-inspired, it's definitely packed with her favourite things! I started off in Poundland, because I know they're great for cheap & cheerful themed trinkets. This is where I found the felt skull bucket, designed to be used for trick or treating. There was also some black and white skull tinsel that I used to wrap around the handle for a little extra pizzazz. Here I also found a variety of press on nails / false eyelash sets. I opted for green because that was the only colour there at the time, but when I went back a day later they had black, red and purple too. On the glamour theme, I also picked up the gruesome glitter face tattoos, which I actually think will be totally fun to create different looks with. And of course, I couldn't leave without adding an inflatable ghost to my basket - a novelty item that adds a good laugh to the gift. For the chocolate and sweets, I headed to Wilko, who have a really fun range of themed candy at the moment. 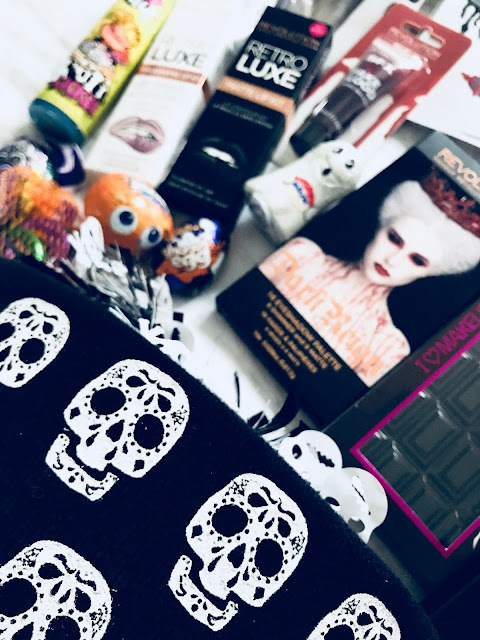 I added chocolate spiders, pumpkins, ghosts and chocolate coins to my gift, and even picked up a 'Brain Licker' sour candy drink. The Brain Licker gave me such a sense of nostalgia to my school days with my sister, and also left me questioning how I ever managed to drink the questionably bright blue liquid back in the day! 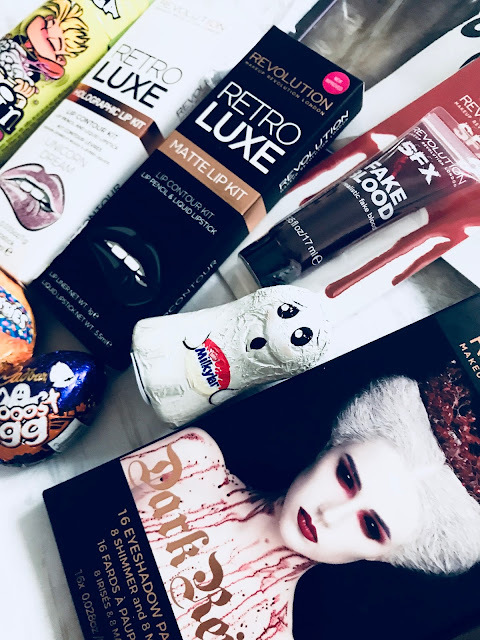 Continuing my quest for Halloween goodies, I headed to Superdrug to check out Makeup Revolution's exciting range of Halloween makeup. 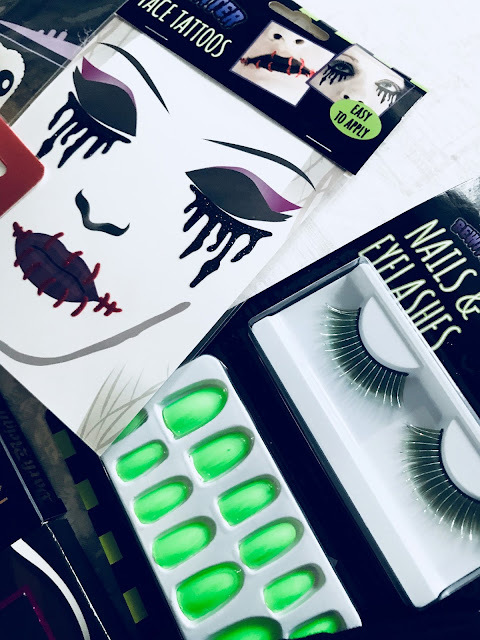 Here I chose their 'Dark Reign' & 'Unicorn Midnight' palettes, some fake blood, and two lip kits. One was matte black, the other a holographic 'unicorn' lip kit - perfect for creating a range of scary-glam looks. I couldn't resist picking up their chocolate vice palette too - the dark black, melting chocolate bar palette was totally calling to me. 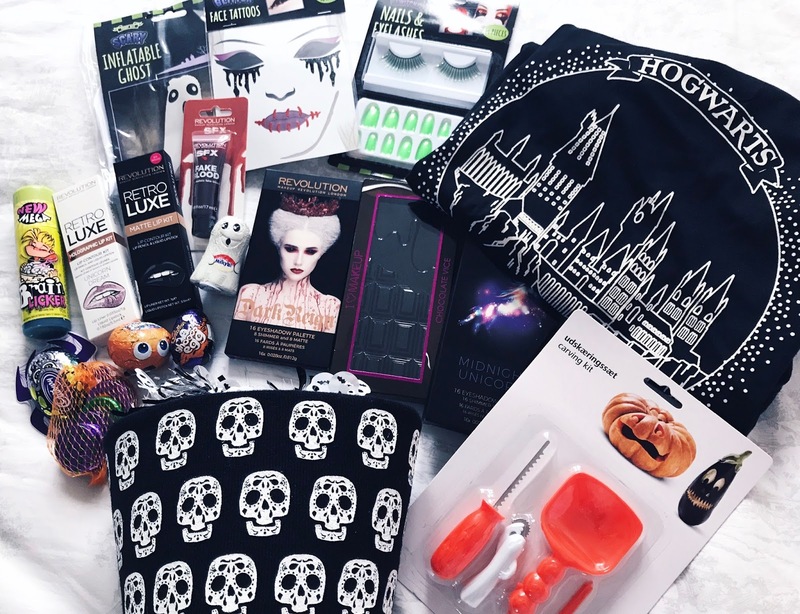 Finally I stopped off in Tiger and found a cute little pumpkin carving kit, and added a Hogwarts T Shirt from Primark too, because if you can't have a Harry Potter Marathon around Halloween, when can you? I decided to individually wrap each item in black wrapping paper, then carefully put it inside the felt skull bucket. I feel like the excitement of unwrapping each treat adds to the gift. As you can tell from the places I shopped at to create this Halloween hamper, it was very inexpensive. The only thing that bumped the cost up a little was the quantity of makeup palettes I included in the mix, but they were just irresistible to me, and I knew my sister would love them all. You could very easily switch them out for something else though, if you were going to recreate this hamper for someone else. I very nearly included some of our favourite Halloween films too, but sadly ran out of time before my sister came to visit. I don't know about you, but I'd personally love to receive a gift like this, and always have so much fun making themed presents for people. I may even go down a similar route to this for my family's Christmas gifts this year, but thankfully there's still a little while off yet before I have to worry about that! Thank you for reading though as always, I hope you can draw some Halloween inspiration for yourself from this post! Let me know your thoughts on my hamper below, I'd love to know what you think of the idea.